Part 1 of my "Vintage bicycles in Bali" post focused on the many vintage styled bicycles in Bali. Some of the bicycles were probably from the 1930's to 1950's, however on closer inspection I found that the majority of the bicycles were modern copies, mainly of the "Phoenix" brand (of Chinese manufacture) that perhaps were only 20 years old. Some were even more recently made and are still available for purchase in new condition. A Phoenix with 28 Westwoods and cottered cranks. 32 hole front hub, 40 hole rear hub. An everyday classic with 28 inch Westwoods. As there were so many of these bicycles I was curious to find out where they sourced their spare parts. This interested me because vintage bicycles are hard to locate in Perth and I have always found it difficult (and expensive) to source original or new parts when restoring a vintage. So whilst holidaying in Bali I hunted around for some bicycle shops that carried old spare parts for vintage bicycles - and they were common and easy to find. I walked into one shop and hanging from the ceiling was a row of about 40 brand new chromed Araya brand 28 inch Westwood profile steel rims. They were hung in two groups - 32 hole rims, and 40 hole rims - all shiny and new. All the rims were perfect, and all were coated with a thick generous coat of chrome - they looked fantastic, never before had I seen such a thing. I had only recently restored a 1974 Raleigh Tourist DL-1 roadster (Dec 2010 posting) and had the 28 inch Westwood rims rechromed in Perth, an expensive exercise!! In Perth I could not source any new chromed Westwood rims for the job, and at the time I found this very frustrating.....but there they all were...... hanging right there above me......and much to my surprise they only cost about 20 Australian dollars for a pair...amazing. So I grabbed a pair of chromed 28 Westwoods (32/40's) and continued hunting through the shop for other parts. I also located a pair of new shiny 26 inch Westrick chromed rims (32/40's) that I was also happy to take with me....only about 15 Australian dollars for these ones! I located rod brake parts, vintage styled cottered cranks and bottom brackets, 28, 32 and 36 hole front hubs, an assortment of 28, 36 and 40 hole rear hubs - some with coaster brakes, and all sorts of other goodies for old vintage classics - fantastic. Some parts had various manufacturer's markings (probably of Chinese origin) and most were good quality and made from chromed steel - perfect for vintage builds. I bought lots of goodies - mainly opting for those parts that had no maufacturer's markings as I consider that these parts would be more suitable for use in English vintage restorations. Sure....original parts are always best, but some parts are very difficult to locate and the parts I grabbed will definitely come in handy.......especially the rims. To my surprise.....at the back of one shop a couple of new roadster classics for sale (Raleigh DL-1 copies) pictured below. A couple of roadsters tucked away in the corner. I located several shops in the Kuta area and a couple in Denpasar. On inquiry I found that all of the shops could source almost any vintage parts for the old Phoenix bikes rolling around the island - and all of the shops had at least one pair of brightly chromed 28 Westwood rims hanging up somewhere in the store. .....including an English made Hercules for sale!! In my travels I also inquired if there were any vintage cycle clubs on the island and was told that there was.....although the bicycle shop owners were not able to provide any specifics. 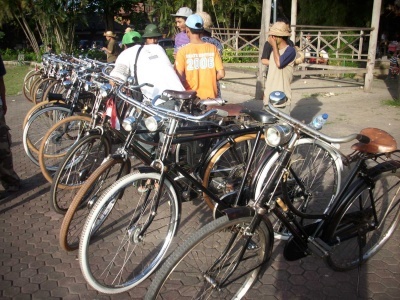 Here's an image I located from "The Jakarta Post" site capturing members from the 'elusive' Denpasar based Bali Vintage Bicycle Association. 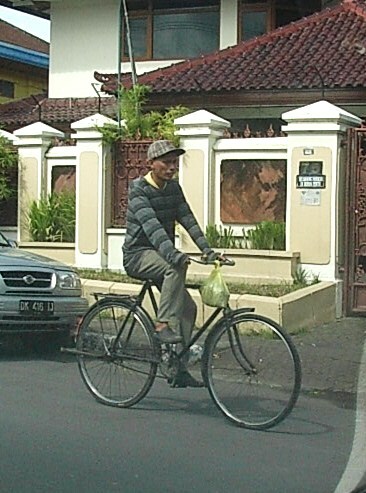 OK....so I've gone to Bali and bought some vintage bicycle goodies, how do I get them home? Excellent question! The small stuff is easy, just wrap them in newsapaper and put them into your normal baggage, whilst giving consideration to the overall weight of your bags of course. The only issue I had was with the rims - not an issue realty, just a little more effort. I went to a local supermarket and bought a large roll of brown packing tape and wrapped the rims (placed side by side for strength) with newsapaper and packing tape. I then bought a cloth serong from a market stall and wrapped the rims again with this and more packing tape. The final package was nice and secure and very robust. At the airport I labelled the rims with my personal address and the ticketing guy was happy to place some 'fragile' stickers over the whole package. The item went through as a normal luggage item and as my allowable weight was not exceeded I was not charged any excess - easy really! People bring home all sorts of unusually shaped items from Bali so the rims did not attract any attention from the authorities. Although I did have to remember to collect the item from the baggage carousel when returning home! Once at home it was nice to build up the rims that I had found in Bali. Here's a couple of images of the 28 inch Westwood rims after having them laced.....just perfect for a vintage rebuild!! 32 hole front hub with wingnuts. 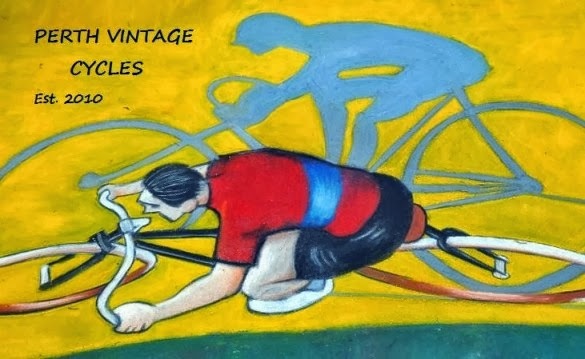 So if you restore old vintage classics and plan on travelling to Bali, or anywhere in Indonesia for that matter, make sure you visit their cycle shops where you're sure to grab something you need. So until next time, safe riding! you can also so this in india, as there are many traditional roadster bikes still being produced. also bike shops with rims, tires, brake shoes. it's great! i wasn't aware of how to bring back the rims to the usa, but thanks for the tips.